Just Bliss as holistic hotels make waves. Adelaide’s Zoë Watson, pictured, is building more spaces for women to nurture and heal. A third retreat is being planned for Ubud in Indonesia in the not-too-distant future, following major international tourism award wins. 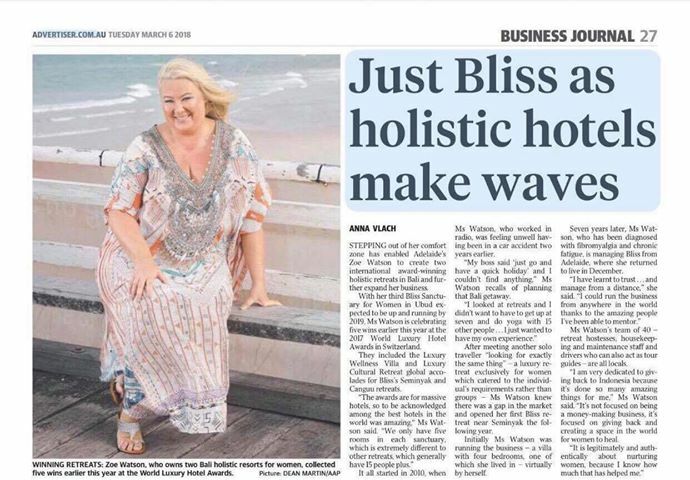 STEPPING out of her comfort zone has enabled Adelaide’s Zoë Watson to create two international award-winning holistic retreats in Bali and further expand her business. With her third Bliss Sanctuary for Women in Ubud expected to be up and running by 2019, Ms Watson is celebrating five wins earlier this year at the 2017 World Luxury Hotel Awards in Switzerland. They included the Luxury Wellness Villa and Luxury Cultural Retreat global accolades for Bliss’s Seminyak and Canguu retreats. It all started in 2010, when Ms Watson, who worked in radio, was feeling unwell having been in a car accident two years earlier. “My boss said ‘just go and have a quick holiday’ and I couldn’t find anything,” Ms Watson recalls of planning that Bali getaway. After meeting another solo traveller “looking for exactly the same thing” – a luxury retreat exclusively for women which catered to the individual’s requirements rather than groups – Ms Watson knew there was a gap in the market and opened her first Bliss retreat near Seminyak the following year. Initially Ms Watson was running the business – a villa with four bedrooms, one of which she lived in – virtually by herself. 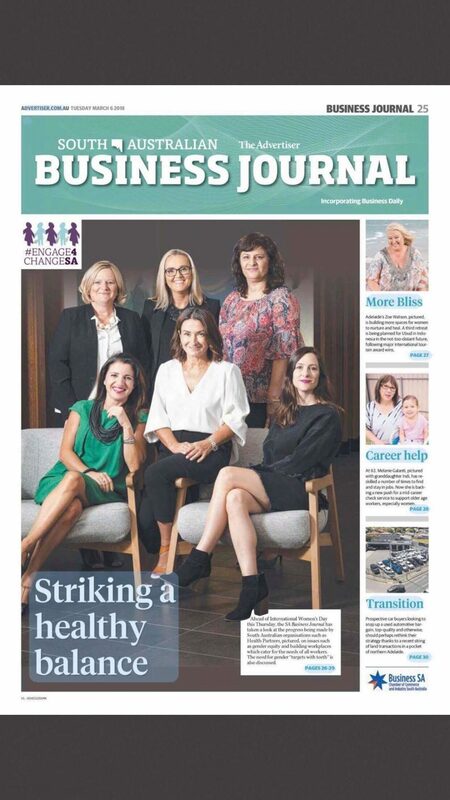 Seven years later, Ms Watson , who has been diagnosed with fibromyalgia and chronic fatigue, is managing Bliss from Adelaide, where she returned to live in December. Ms Watson’s team of 40 – retreat hostesses, housekeeping and maintenance staff and drivers who can also act as tour guides – are all locals. “I am very dedicated to giving back to Indonesia because it’s done so many amazing things for me,” Ms Watson said. “It’s not focused on being a money-making business, it’s focused on giving back and creating a space in the world for women to heal.